We have the perfect hostess gift! 50 Personalized Zip Code Napkins make the perfect gift for every gathering. These triple ply cocktail napkins add a fun touch to every party, whether it's a holiday party or afternoon bbq. 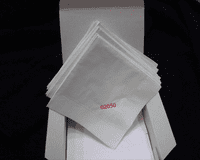 Each pack of napkins comes boxed and gift wrapping is available. Looking for Napkins for another occasion--We have plenty! Please Call store for more options! Please Choose First Class shipping for discounted shipping on this item.